Hyundai’s new N Line is a mild performance treatment for the cars that aren’t its full-on N sports car variants, like the i30N and Veloster N. The first in the U.S. to get the treatment was the 2019 Elantra GT N Line. Now there’s the Hyundai Tucson N Line—the first N Lined SUV from the Korean automaker. The suspension’s been tweaked to offer five percent more rigidity in the rear and eight percent more in the front, according to a company press release, which I’m sure makes all the difference in the world. The steering will be more direct- and linear-feeling, thanks to some software enhancements. The car also has redesigned bumpers and a dark mesh grille. Nineteen-inch alloy wheels, wing mirror housings and a rear spoiler all come in black, as do the black-bezel headlights. There are unique daytime running lights and darkened window frames. Inside are leather-suede sport seats, red accent stitching, alloy pedals and a red-accented, leather-wrapped N gear shift lever. Like the i30 N Line, there are no power upgrades, so it can be had with either the 1.6-liter gas engine with 174 horsepower or with the 1.6-liter and 2.0-liter mild hybrid diesels, both with 134 HP and 182 HP, respectively. Those can be paired with front- or all-wheel drive, with either a seven-speed dual-clutch auto or a six-speed manual, according to Motor1. Neat! I don’t hate the Tucson N Line, I really don’t. 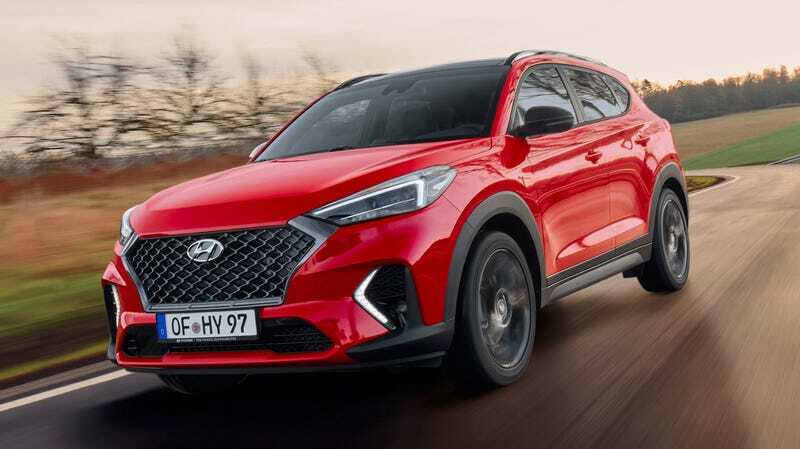 I think the styling looks nice and I very much appreciate a mild performance version of what’s probably going to end up as an affordable SUV. I could do without all of that black plastic cladding, though.